Co-Creation: Is it the Wave of the Future? There’s no doubt that customer feedback plays an essential role in branding and product innovation. Today, brands are taking customer involvement to the next level with co-creation. Co-creation is the process where consumers and brands work together to create better ideas, products and services. There are a number of brands getting on board with the co-creation process. Here is a bit about how brands are taking customers feedback up a notch to help them grow and improve. An insight community is group composed of a company’s most trusted stakeholders, customers, partners, employees, fans, donors and alumni. They give you rapid ongoing feedback that can help you make confident business decisions. Many companies use these insight communities to help them understand the direction they need to take and even to develop products for the future. Some companies celebrate innovation and creativity by rewarding customers with an opportunity to come up with new product ideas. They advertise contests in which they are taking suggestions for new products and services. Once they have a list of finalists, they have fans vote on which they like best. This sort of event can serve to increase engagement and loyalty in customers. Another great way to incorporate co-creation in the growth of your company is in a workshop group. 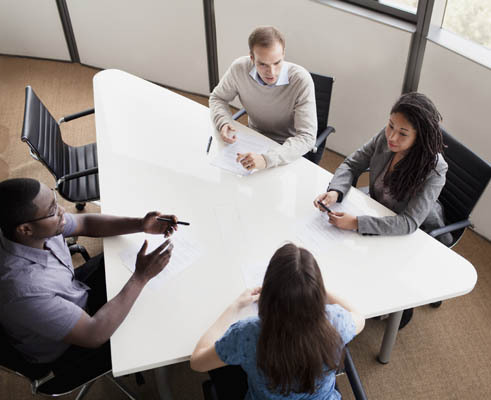 Working a bit like a focus group, customers can meet with company reps to discuss areas in need of improvement within the company and come up with ways to solve problems. For some companies, feedback can be a great way to increase loyalty and engagement. For others, it can be an integral part of doing business. One example of this can be seen in the football brand Manchester City FC where any brand or website update must be bounced off supporters to avoid backlash. Small changes like improvements made to the web and mobile experience took several focus groups, surveys, tests and prototype designs before meeting with final approval. While co-creation can be a great way to make customers feel more invested in your brand, companies must be clever in launching campaigns that promote this type of involvement. That’s where the help of a professional branding and design agency can come in handy. These agencies can help you to create a unique premise for customer involvement that is sure to boost customer interest in your brand. If you are looking for a creative design agency that can help you with a co-creation campaign, look no further than San Diego’s Lien Design. They are on top of the latest trends and have the know how to make your brand stand out no matter what type of branding campaign you are looking to create. Whether you are looking for innovative logo design, updated packaging or a great looking web site, Lien Design can help your brand stand out from the competition.